The title totally enticed you, didn't it? So, the random fact is... I hate it when my food touches! Divided plates are my best friend! My mom buys special divided paper plates at family gatherings with me in mind. I have "adult" white Corelle divided plates for me in our home. So... what does this have to do with anything? Well, fortunately or unfortunately, I have passed this dislike of food touching off to my children. We had a few divided plates plastic around the house, because they're easy to find for kids, but they were all mismatched. A few had plastic peeling on them (yeah, that's really healthy). They never stacked well. It drove me crazy because our cupboard was a hot mess of mismatched plates. I was so intrigued when I saw my friend, Elizabeth, share about Re-Play dishes. They are so bright and cheerful looking, that I just had to try them out for myself! First off, the colors are just lovely! Basically you can get the whole rainbow if you really want to! I got the Kelly Green set, and my boys love the color. 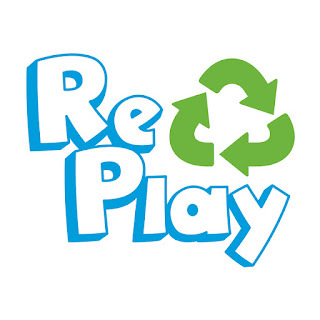 Along with divided plates, Re-Play also offers sippy cups, spoons and forks, cups, bowls, and snack containers. I got to try out all of them. Henry isn't a huge sippy cup lover any more, so the real cup was perfect for him. The bowl is just the right size for a snack around the house, and the snack cup is great for on the go with its screw on lid. The sections in the plate hold the kid-sized portions well. The big container holds a full hot dog bun with room to spare. The smaller sections are just right for fruits, veggies, and crackers. And stacking? The plates stack up perfectly. Yes, I've already bought additional plates! This neat and tidy stack makes my cupboard happy. And all the colors? There are so many to choose from. Check out Re-Play on Social Media! Want to try them? Well, lucky for you, Re-Play is giving away a set to one of my readers! Enter below!